The Incredible Hulk Video Slot is a 5 Reel 25 Payline Video Slot based on the Marvel Comic book and TV show of the same name. Well obviously! What we mean to say, is that it is the official Incredible Hulk Slot: accept no imitations. 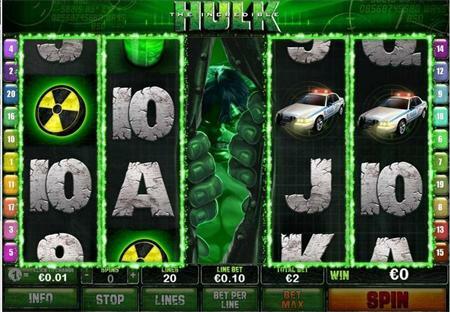 The Incredible Hulk online slot has wilds, used to help complete a paying combo, and a scatter card. You get a bonus when you land 2 scatter symbols on the screen. Land 3 and you are into the Incredible Hulk Bonus game. The Incredible Hulk Bonus Game is great fun. You�re the Hulk and your being chased down by 5 rocket helicopters. You have to choose which weapon to use and which helicopter to target. So pick a car, for example, and lob that at one of the helicopter gun ships. Remember, you are a strong green man!